No matter what industry an organization operates in, every business has one very important process in common: payment. Whether your have to pay a vendor or provide tender to a customer according to specific invoices, reimbursement for goods and services is something everyone takes part in. For decades, the payment process remained the same – merchandise or labor is provided, and upon completion, the customer pays the provider. This process mainly leaned on manual, paper processes. Today, however, there is a better way. Before payment automation, workers had to manually match invoices and ensure that service providers and customers were paid. Not only did this take considerable time and effort to support accurate payment and overall accounting, but any lost or misplaced invoices could result in late payments – as well as negative impact on the company’s standing and reputation. Payment automation tackles these issues head on, removing the need for manual, paper-based processes and reducing the time it takes to reconcile bills. This means your employees can work on other mission-critical tasks while payments are taken care of automatically and correctly every time. In fact, business printing firm Relyco found that automation can cut the average invoice approval time from 28 days to just under 3 days. What could your company do with an extra 25 days of production time? Workflow automation can result in considerable savings. Eliminating paper processes can do much more for your business than just improve its efficiency. This benefit goes hand-in-hand with cost savings, meaning your organization gets back both time and money. 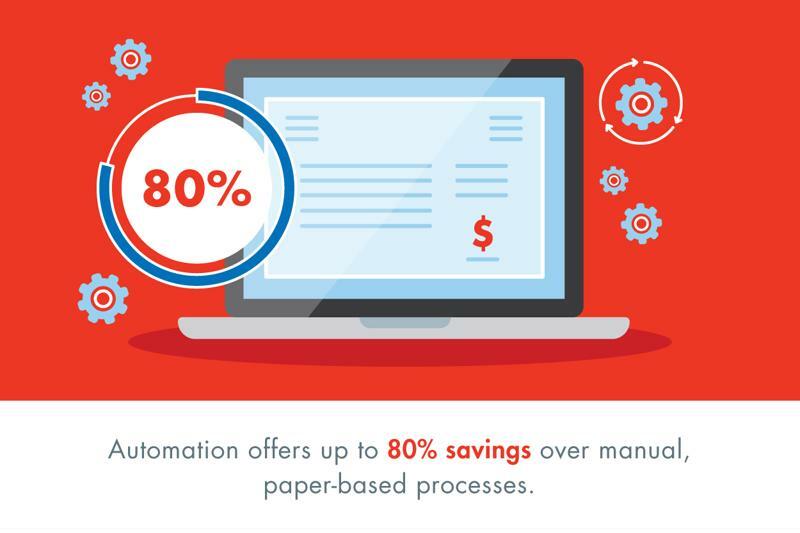 Automation can contribute to as much as 80 percent savings over manual, paper-based processes. Considering this fact, it is easy to wonder why many enterprises have not yet automated their accounts payable operation. Up to 80 percent savings alongside the ability to align with top businesses focuses makes payment automation the ideal solution for today’s accounting departments. There are few problems that impact your finance team more than incorrect invoices or payments. It’s an issue that every organization has dealt with at some point, particularly those that still rely on manual data entry. Because payment automation can integrate with an array of banks to streamline the payment process, it removes a layer of data entry during which mistakes most commonly appear. In this way, accuracy is supported throughout the process and payments are always correct. To find out more about the kind of advanced banking and treasury automation that can bring these benefits, visit our website and take a moment to check out our video today.